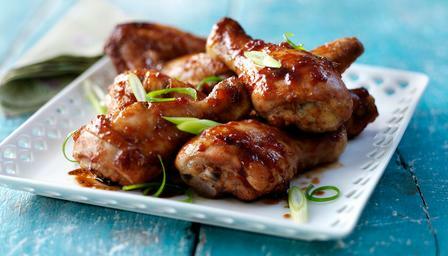 This is a no-fuss barbecue chicken recipe - simply marinade the chicken overnight and throw it on the BBQ. Once it has marinated, place the chicken on the barbecue over medium-hot coals and cook for about 20 minutes, brushing with any marinade left in the dish as it cooks. If it's colouring too quickly, move to a cooler part of the barbecue to cook more gently. It's important you cook the chicken all the way through. If you're unsure, pierce a drumstick with a skewer: if the juices are still pink, carry on cooking. Eat as soon as they're cool enough to handle, with the sticky sauce all around your mouth and fingers. Isn't that what barbecues are all about?